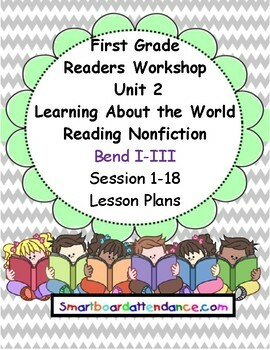 Readers Workshop Unit 2: Learning About the World Reading Nonfiction. This lesson plan bundle guides you through all three Bends I to III of Unit 2, Sessions 1 to 18. 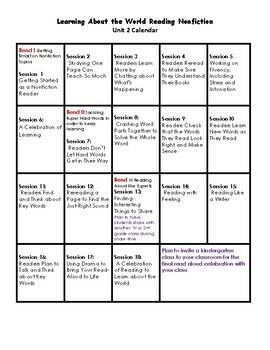 The lesson plans include all components of the Mini-lessons: Connection, Teaching point, Teaching, Active Engagement, link, Mid-Workshop Teaching, Conferring, and Share. 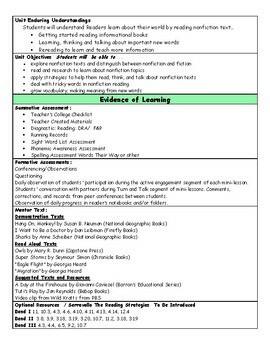 The product includes a unit plan, monthly calendar, essential questions, enduring understanding, objectives, and Common Core State Standards. At the start of the unit students will be taught about text features and how to navigate through nonfiction text. They will be reminded to apply all that they have already learned about reading as well. Towards the middle of the unit, students will be encouraged to talk about, decode, and develop an understanding of new vocabulary that is domain specific. 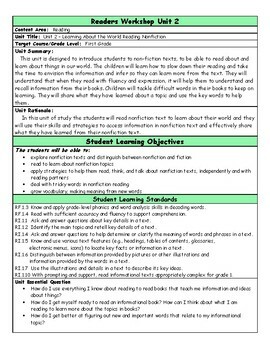 Towards the end of the unit, students will be encouraged to study both the words and text features to deepen their understanding. Post-it notes and conversations will help prepare the students to teach others about their topic of choice.